We’ve covered the Woodward Dream Cruise, the enormous annual car show on Michigan’s M-1, in the past. But as good as that event is, even a standard run-of-the-mill Saturday on the iconic road is heaven on Earth for us Jalops. Here’s what I saw yesterday morning. I dropped by Woodward Avenue yesterday for just an ordinary Saturday car gathering at Pasteiner’s. 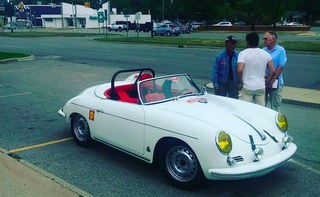 Though I’d been to plenty of car shows on Woodward, I must admit yesterday’s Cars and Coffee melted my mind. I’ll admit that I struggled to pull myself together; I was spazzing out. After all, who expects to see a Meyers Manx with a Porsche flat-six, a Ferrari Dino and a Bitter CD all at the same little gathering? The beautiful thing about Saturday morning on Woodward isn’t just the cars, it’s the people. I had the pleasure of exchanging stories with former line workers, designers, engineers and auto journalists. It seems the who’s who of the car kingdom is all just chilling right here on this pothole-laden street on a warm Saturday morning. It’s a Jalop’s dream.